When crisis occurs, we can respond in several ways. We can crumble under the pressure and bury our heads in the sand. We can become bitter or self-pitying, or we can analyze the situation, learn from it and move forward. No one would disagree that the ongoing issue of police officers killing Black people with impunity is a crisis on a HUGE level. Rather than becoming bitter, self-pitying or indifferent, I suggest we see this issue as a teachable moment (in addition to resisting it at every turn). Every time a police officer murders a Black person in the United States and faces no adequate punishment for his/her deed, we protest or cry out for justice. Whites collectively respond to our protest, usually in resentful and non sympathetic ways. We can learn much about the nature of this country via white backlash to Black resistance. This phenomenon reveals much about white supremacy, the perception of Black people, and whites’ own sociopolitical challenges. The tragic and unnecessary murders of Trayvon Martin, Eric Garner, Michael Brown, Akai Gurley – and in a separate but related issue – New York City police officers Rafael Ramos and Wenjian Liu, teach us about the issue of police brutality and its related consequences. But our lessons don’t stop there. These tragedies also pull back the curtains of white American psyche and reveal disturbing attitudes, perceptions and instincts that forcefully explain the significance of race in our society. First, we must understand that police brutality is not a new or modern phenomenon. State-sanctioned and organized violence has always been the “enforcer” or “muscle” behind the edifice of white supremacy. This relationship began centuries ago when whites first invaded the African continent and snatched Black people to be their non-consensual laborers. Coercion manifested again when European powers colonized the continent, and used indigenous labor to mine the soil for diamonds, gold, rubber and other resources to jump-start European industrial growth. Whether under the guise of enslavement, colonialism, imperialism or modern inner-city occupation, military force was/is a constant. The only differences were the uniforms, weapons, and language used or time period in question. Why was military force so crucial to the projects of enslavement, colonialism and imperialism? No one wants to be exploited, enslaved or mistreated. People typically rebel, resist and refuse to cooperate with their subjugation. White supremacists therefore needed coercion to control our wealth and labor and intimidate us from mounting any resistance to their efforts. Police – despite what we learned in school – do not actually exist to “protect and serve” the poor or marginalized. They exist to protect and serve state power, policies and property. They exist to monitor, intimidate, and control the masses so that the corporations and government can run smoothly and safely with minimal glitches. This is not to suggest that modern police do not provide certain important services to non-affluent or melanated citizens. They do intervene in domestic disputes and help to prevent or solve a variety of petty crimes. This should not surprise us, nor does this fact negate the oppressive role of police. A functional society requires some degree of safety and order (complete chaos and unpredictability is bad for business). Also, an aspiring police-state in a “leader of the free world” nation like the United States must carefully camouflage its sinister intentions, lest it lose face throughout the world and lead the masses to initiate full-scale revolution. When we challenge police brutality then, we confront more than police violence; we also challenge the very nature and structure of U.S. culture, including its para-military components. Certainly the police force needs serious reform but even farther, the nation and its police force need to be dismantled and rebuilt with vastly different objectives, values, and methods. While the corporate media and the police force itself will strongly disadgree, the police force exists to protect white racial and corporate interests and whites for this reason generally are supportive of them. Some whites do acknowledge and oppose the disproportionate assault and murder of Black people by police officers. In city after city, whenever protests occur, we notice mixed crowds, with whites chanting, marching, “dying-in” and being arrested, alongside Black folk. Regardless of our political ideology, we cannot simply asume people’s politics based on their racial identity. We cannot easily place people in rigid categories or sides regarding the issue of police brutality. 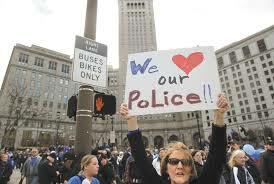 For example, We know of police watch groups and activities supported largely by white activists, and regular citizens. Their struggle and sacrifice are duly noted and appreciated. Many whites even when presented with the statistics and other evidence refuse to acknowledge anti-Black police brutality. This denial is sometimes psychological. Such whites don’t want to admit that this country still mistreats certain citizens because they desperately need to believe that this country, and by extension themselves, are as fair-minded, and good-hearted as they proclaim they are. How else can people rail against human rights abuses in other nations and psychologically distance themselves from their equally inhumane behavior? How else can they salute the flag, and praise American military campaigns against the “bad guys” overseas? In the divisive game of us vs. them, privileged whites need an outsider to oppose. Therefore, whites’ insensitivity to us meets a psychological need. Some whites don’t empathize with the pain and suffering of Black people because deep down inside they believe the racial stereotypes classifying Black people as violent, criminal and prone to exaggeration about racial injustice. In other words, when a cop assaults or kills one of us, they believe that we deserve it. The white establishment has long worked to separate whites and Blacks and encouraged even poor whites to have antagonistic relations with and perceptions of Black people. There was a time – the period during which the “United States” was a collection of British colonies – when poor whites and Blacks fought together to defeat the rich white planter class in the U.S. Privileged whites responded by legally punishing poor whites that sympathized with Black resistance rather than enjoying and defending their racial privileges. This created a false sense of alliance with privileged white elites against Black people with whom they shared class oppression. Creating rigid racial and class divisions among poor whites and Blacks serves the elite’s interests, as they can prevent possibly revolutionary interracial class alliances between Blacks and whites, and maintain control over both groups. In this sense, whites have been duped. Many whites have a deep-seated fear of Black violence and retribution. Given the opportunity, they believe, Black people will harm or kill them in retaliation for all the years of white discrimination, brutality and exploitation. They see the police then, as their security blanket against Black insurrection and therefore are prone to support and defend them. This also explains the exaggerated media, financial support, and “hero” status awarded to slain officers Ramos and Liu. This becomes necessary both to support American values and reverence for the police. The sad reality here is that for all the so-called “progress” everyone tell us we’ve made, white supremacy, along with its insulting assumptions, perceptions, and unwritten truths, is alive and well. It is infuriating to know that the average person will get more jail time for killing a DOG than they will for shooting and killing an unarmed Black man. Just ask Michael Vick. This fact, and the fact that white folks are comfortable with and derive privileges from the racist state of affairs, practically guaranteeing a long life for white supremacy. It’s not just a simple matter of life and death, but of privilege, identity, and values. And that is the grand lesson here. Black lives, in far too many instances only matter to Black people….. Thank you for posting this. White people are waking up to this problem. I am one of them. These crimes are unthinkable and they must stop! Sure about that? Here’s an article from the very conservative RedState even. And this white likes to say the meaning by BLM is black lives matter TOO. I appreciate you reading the article and taking time to respond. There is a tendency for people to refer to the “good” or “evolved” white folk whenever white supremacist or oppressive behavior is discussed. Or, to reduce an entire article or speech’s significance to a two-line response patting white folk on the back. This of course, begs the question: “Is this empathetic white response reflective of the collective, or is it exceptional? I suggest that such statements (and white folk) are NOT the rule, but the exception. Put another way: “If so many white people are empathetic to Blacks’mistreatment and frustration concerning police brutality, why don’t we see this flood of altruistic whites in the streets demanding justice for Blacks, in the media offering critiques of state-sanctioned murder, raising money, or proposing legislation to prevent its existence? Why do so many defend the police and criminalize Black people? Read closely. You will find the answers to these questions right in the article I wrote. Next Next post: Police Brutality is The Issue!